We stopped by Roku on Sunset blvd here in West Hollywood to try their brand spanking new Vegan menu. Sushi Roku is famous for their top tier sushi here in Hollywood, and to top off their already wonderful menu, they have now added a $40 four course meal for their Vegan patrons. Thats right an entire dining experience for vegans for $40. Lets be real, where else can you get an amazing salad, appetizer, entree, and desert for $40 in Los Angeles. We were blown away by the delectable options. But don’t worry for our fellow sushi lovers we also dug into some house staples to share as well. We kicked off our Vegan experience with Roku’s Organic Kale Salad, which features King Oyster Mushroom, Crispy Shiitake, and is tossed in a Ginger Plum Vinaigrette. The crispy Shiitake were a massive hit, and we discovered Roku makes them in house. Our next stop on the Vegan menu was their trio of appetizers known as: Santen Mori. We tried their roasted Cauliflower, Miso Eggplant, and Grilled Corn (which is similar to Mexican street corn). Finally we had arrived at our entree selection. Normally you choose one, but we tried all three to give you our reaction and genuine photos of your meal choices. Their secetions are: Tofu Steak with Mixed Mushrooms Tobanyaki, four pieces of Vegetarian Nigiri and Vegetable Roll (items tbd) or Grilled Avocado with Ponzu. We lost our mind when we took a bite of their grilled Avocado. While all the selections were tasty, the Avocado stole our hearts. Especially since the Avocado comes warm, with a spattering of ponzu sauce which flavors immaculatly when sprinkled with the bit of fresh lemon they bring alongside. The Vegan menu ends with a dessert which changes regularly and is the chef’s choice. At the moment Roku is serving a chocolate mousse made with Avocado. We couldnt have guessed Avocado graced this dessert, perhaps its perfect creamy texture? We found te chocolate to taste a bit like coconut. We loved the combination of flavors, this pint sized desert was the perfect finish to a lovely meal. From the regular menu we also made sure to give a couple of their items a taste to ensure the best recommendations for our pescatarians and seafood lovers who follow “Dinner Diaries” weekly. We kicked off our choices with their Hanabi (crispy fried rice and spicy Tuna). We cannot recommend this appetizer enough. The tuna has the perfect level of spice and the rice is that perfect foodie crunch we all crave. We also tried their Taro Tartar. 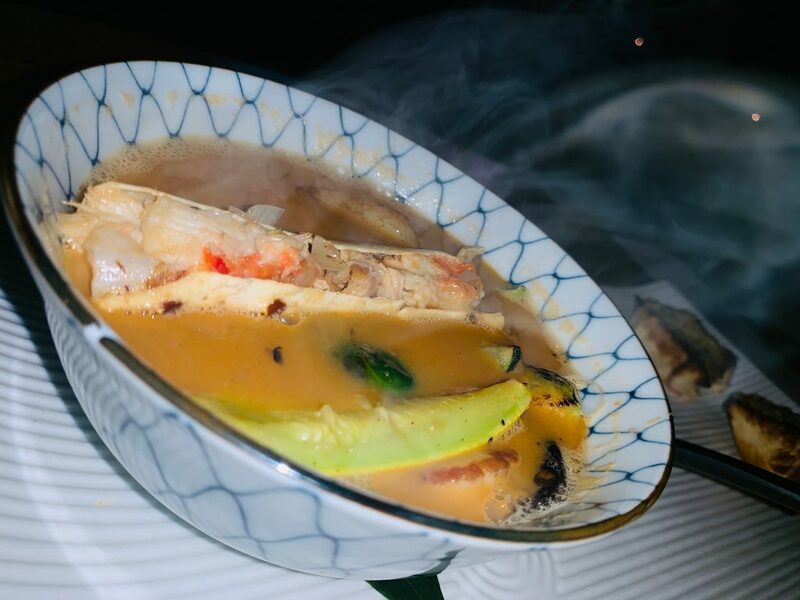 The Taro arrives in a stunning presentation, with smoke courtesy of dry ice, stirring your anticipation. Unlike Tuna Tartar don’t expect chips to coincide with your Taro. This is more of a sashimi type appetizer. We promise the fresh quality of the Taro and the well balanced flavors blended into the fish are the ultimate reason to say yes. This is one appetizer we’d never skip. For dinner we ordered Roku’s Seafood Bouillabaise. The flavorful explosion put us into a food coma. We love a hot meal. Not only was it flavorful, but every bit of seafood choosen complimented each bite. It was a bowl you wish would never end. Finally we gave Roku’s flank steak a try for our tried and true meat lovers. Beautifully sliced and cooked to perfection, we highly recommend the steak if you’re looking for a seafood break. The flank steak is also accompanied by an assortment of sauteed vegetables like bok chop, brussel sprouts and squash to name a few. This is an incredibly well rounded entree selection. Let us know if you’ve been to Roku and what your favorites were. What did you like most from their new Vegan menu? We can’t wait to hear from you.